A special Thank you to Harlequin and Net Galley for sending me this book to review. WOW! This next installment is awesome! We finally get the character development that I so wanted. I got to know the characters better along with all the adventure and danger they get into! Really enjoyable. This series is going to be big. If you like faeries then this is for you. ALL the romance! WOO HOO! I love a book with some kissing, and this love triangle is sweet! I didn't know who I was rooting for until the end. I just like both the boys. I'm a sucker for anything romantic! There were parts where the charcters were just waiting around for something to happen. Just waiting. I thought that would be a good time for something romantic, since they weren't doing anything else...but we were just waiting. Other than that the book was great! I really enjoyed it! 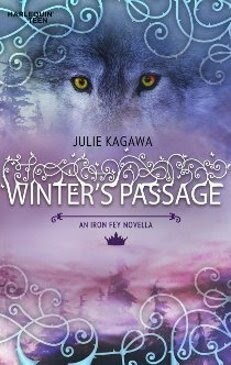 WINTER'S PASSAGE,a free novella in the Iron Fey series will be available for download June 1st. 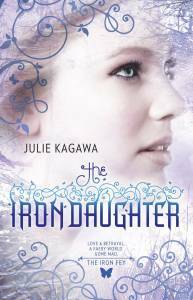 It takes place between THE IRON KING and THE IRON DAUGHTER and follows Meghan and Ash on their perilous journey deep into the heart of Winter. Check out EnterTheFaeryWorld.com for more details. Sounds like a good read. Not sure it would be my cup of tea but I might give it a go. Thanks for the review. I really enjoyed The Iron King and this one sounds even better. Can't wait to read it. Argh... I have to read this series! Usually I don't go for fantasy books but it sounds like I have to make an exception. I'm a fantasy junkie! Got into it a few yrs ago and now I can't stop! I love everything about it. I need to get these two books and read them. I'm glad to hear that you rated this 4/5. I really liked The Iron King, and I have yet to read the rest of the series.